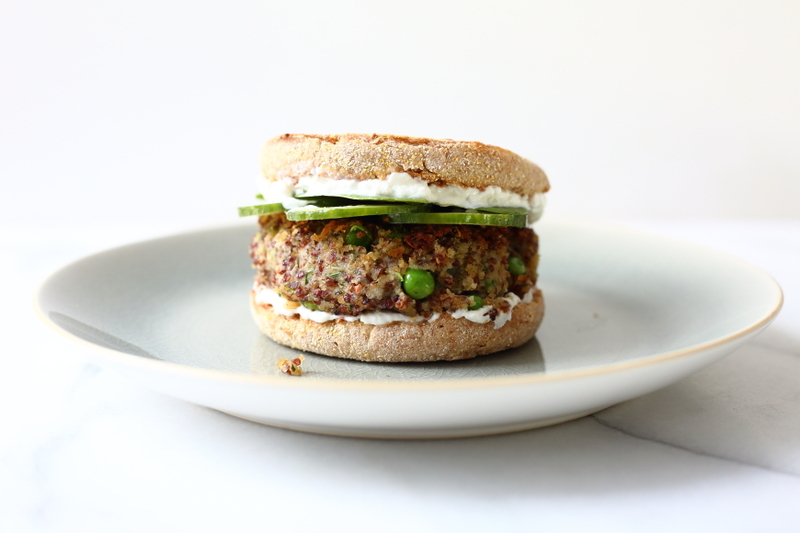 These quinoa burgers are so easy and have become a weeknight favorite around here. 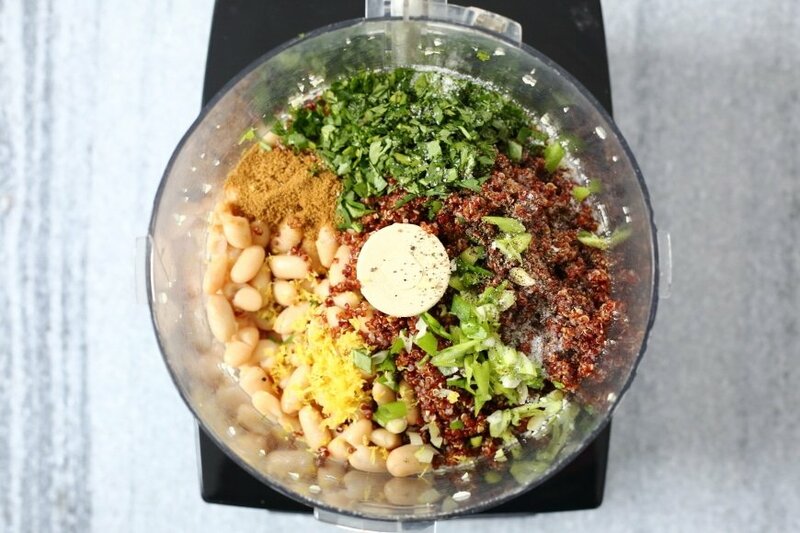 Quinoa gets pulsed with cannellini beans, garlic, scallions, cilantro and plenty of flavorings in the food processor, and then peas and Panko breadcrumbs (regular or gluten free) are stirred in. The cannellini beans provide plenty of “stickiness,” so no eggs or other binders are needed (meaning these little babies are suitable for vegans). The burgers are cooked until golden and crisp on each side and can be served in any number of ways—on a salad, on a bun or even in pita bread. I prefer the quinoa burgers on their own over greens with a smear hummus and smashed avocado, and James likes them on English muffins with a dollop of yogurt, a few mint leaves, avocado slices, feta and spinach (the first time I tested the recipe he even declared it one of the best “veggie” burgers he’s ever had; but, then again, he’s apt to exaggerate once his belly has been filled and his wine glass(es) emptied). Whenever I make a batch of grains (quinoa, brown rice, millet, etc), I always make extra to use later in the week. 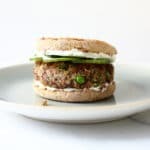 These burgers are an excellent use for leftover quinoa, and the flavorings can be adjusted to what you have or what you’re in the mood for. I’m looking forward to trying an Indian approach with curry powder, topped with chutney and yogurt, or even going Mexican style with chili powder and oregano, topped with avocado and salsa. 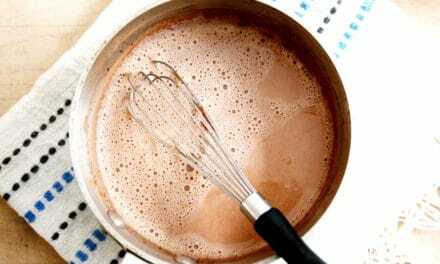 Think of the recipe as a guideline, and don’t be afraid to experiment! 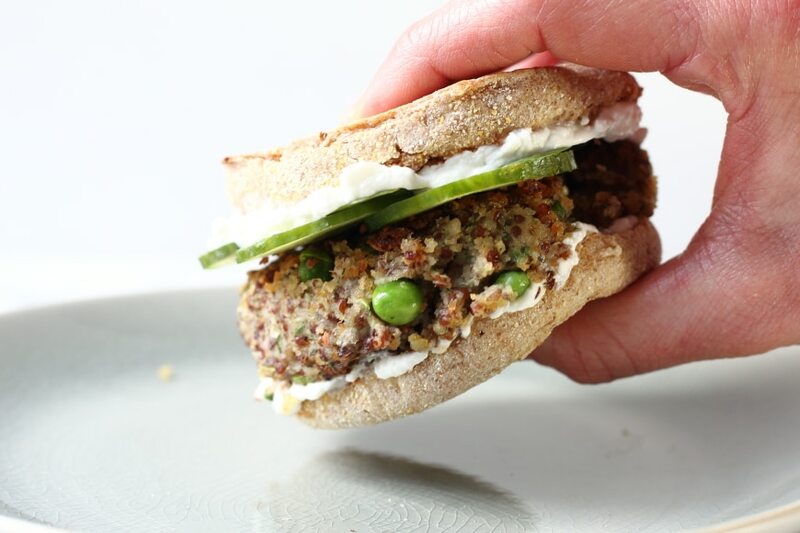 These quinoa burgers are incredibly versatile—you can serve them alone with a salad, on buns, or stuffed into pita bread. Top them with hummus, cucumbers, avocado, Greek yogurt, feta cheese, tomatoes, mint leaves... whatever you like! 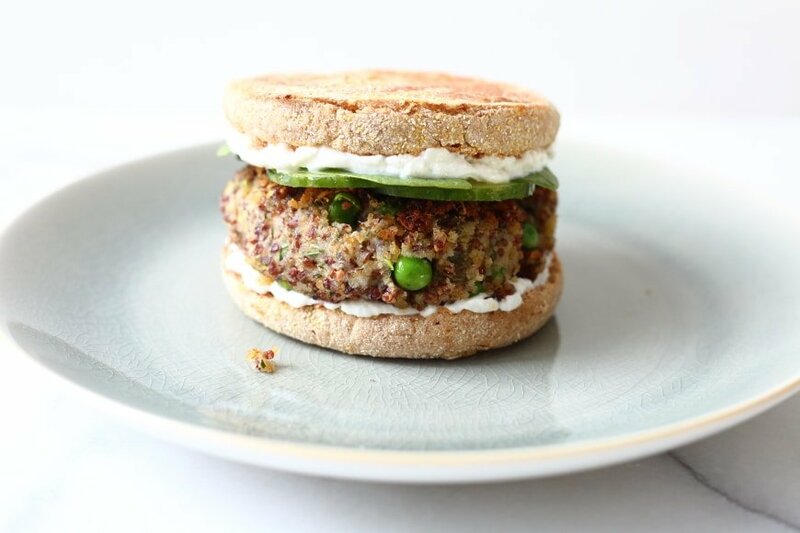 This is a great way to use up leftover quinoa. Toppings for serving,, such as: hummus, smashed avocado, sliced cucumber, garlicky yogurt, mint leaves, sliced tomatoes, feta cheese, etc. Rinse the quinoa well in cold water and drain. Put the quinoa in a small saucepan, and cover by 1 inch of cold water. Season with salt, and bring to a boil. 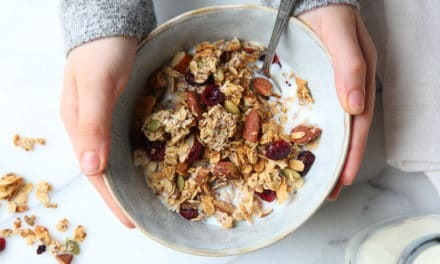 Reduce to a simmer; cover and cook 16-18 minutes, or until most of the quinoa grains have unfurled like little curlicues. Drain and let cool. 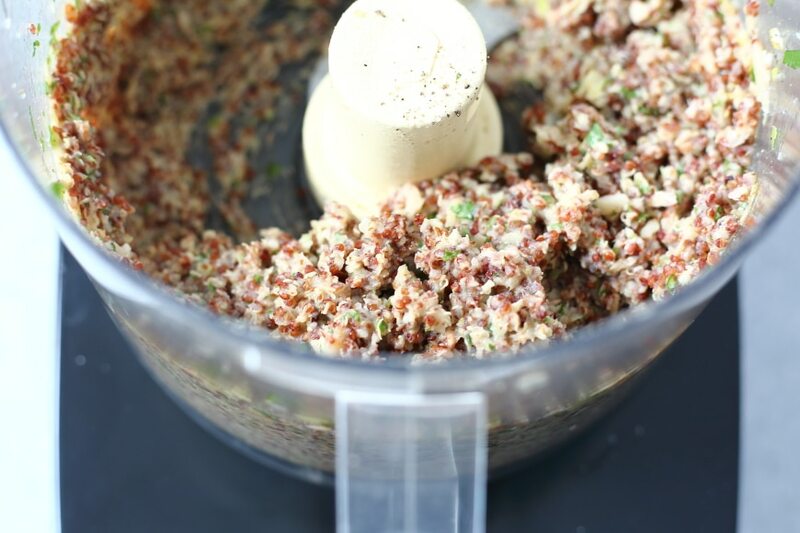 Do Ahead: The quinoa can be made up to 3 days in advance and stored in a covered container in the refrigerator. In a food processor with the blade running, add the garlic cloves and finely chop. Add the white beans, scallions, cilantro, lemon zest and cumin. Season with salt and pepper. Process until the mixture forms a coarse puree, scraping down the sides. Add the quinoa; pulse to combine until a coarse paste forms. 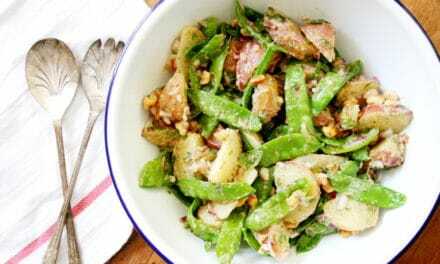 Transfer to a bowl, and stir in the peas and breadcrumbs. 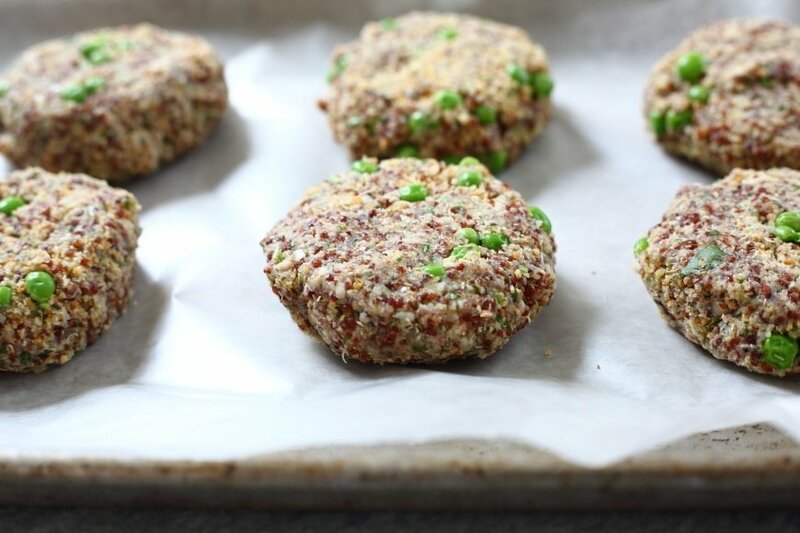 Form the mixture into 6 patties, and place them on a piece of wax or parchment paper. Do Ahead: The uncooked burgers can be covered and refrigerated for up to 2 hours before cooking. In a large cast iron or nonstick skillet, heat the ghee or olive oil over medium-high heat. Add the burgers and cook until golden brown on the bottom, about 4-5 minutes. Flip the burgers, add the remaining tablespoon of ghee or oil and cook until golden on the other side. 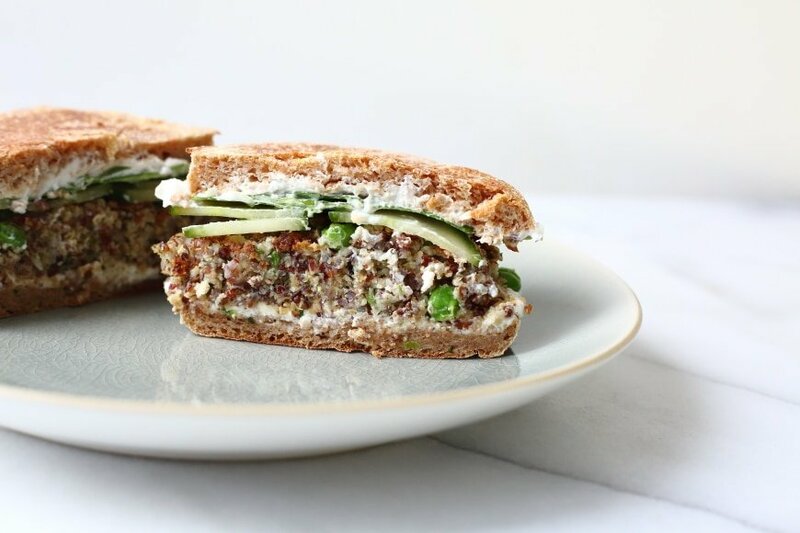 Transfer the burgers to plates (with or without buns, according to your fancy), and serve warm with the topping(s) of your choice, such as hummus, cucumber slices, smashed avocado, yogurt, mint leaves, sliced tomatoes, and/or feta.